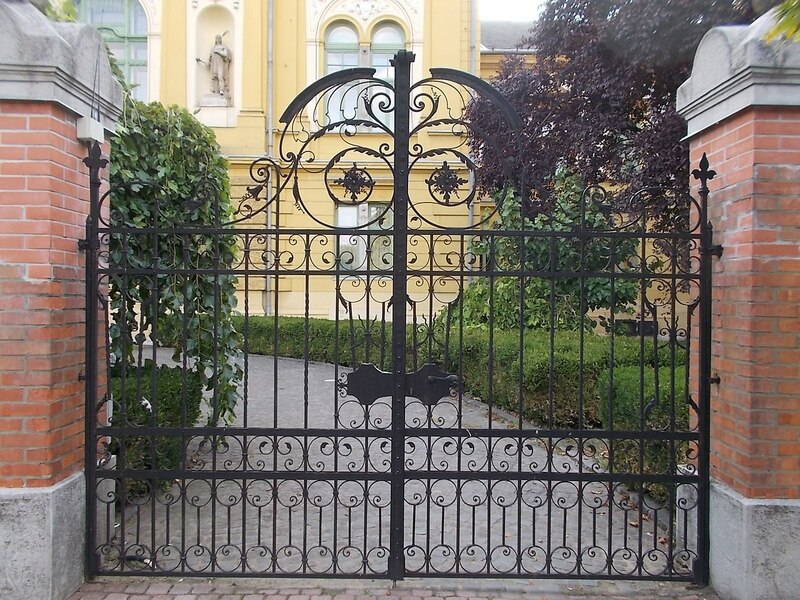 A fine set of wrought iron gates, that might even be wrought iron, in this case. Globetrotter19 [CC BY-SA 3.0]. “Wrought iron” is the phrase that is commonly used to refer to blacksmith-made decorative ironwork. But the problem is that wrought iron itself is a material, a form of refined iron made by working smelted pig iron to release impurities from it. And more to the point, it’s a historic material, except for a tiny quantity made for heritage purposes in a museum, it hasn’t been available for over half a century. The “wrought iron” in that ironwork is almost certainly really steel, unless the piece in question is a very old, and probably very expensive too. To add insult to injury for blacksmiths, a lot of what is sold as “wrought iron” isn’t even made by a blacksmith: there are entire catalogues of machine made components that can be welded together to a finished product for a mass-produced “blacksmith” look. It’s unsurprising then that blacksmiths get hot under the collar. So, given that a lot of “wrought iron” isn’t really wrought iron, what is the real wrought iron? How was it made, and why isn’t it made any more? And to answer that one, we have to go back to the blast furnace, and take a look at the properties of the iron freshly smelted from the ore. Pig iron, so-called because it was once formed in moulds that produced a branched ingot resembling a sow with piglets, still contains many of the impurities from the ore and the coal used to fuel the smelting, much of them in the form of silicon or sulphur compounds. It is extremely brittle, and not of much use as a material. When it is melted once more under more controlled circumstances its impurity content can be reduced, and you will find the result as cast iron. Cast iron though is still brittle, if you hit it hard enough with a hammer it will shatter. Some means of completely removing those impurities is required, and that is the purpose of manufacturing wrought iron or steel. Wrought iron has those impurities oxidised at the surface of a semi-molten mass by continually reworking it with a hammer or through rollers, while steel achieves a similar aim by blasting compressed air through a crucible of molten pig iron. The microstructure of wrought iron, showing the “grain”. Mike Meier (m610) [CC-BY-SA-3.0]. The result in the case of wrought iron is an extremely pure and malleable iron, with inclusions of furnace slag that the working process has formed out into an almost fibrous grain-like structure. This removes the brittleness of pig iron or cast iron, and makes it a much stronger and more elastic substance. It is much softer than steel, indeed if you are used to the hefty blows required for steel forging it is something of a shock to find just how soft it is on the anvil. I have only ever worked it once, my dad had a piece as part of a heritage restoration job, and we tried working it for curiosity’s sake. “Like hammering butter” is how I’d describe it, after working mild steel. Where Did the Wrought Iron Go? So, given its interesting properties, why did wrought iron cease to be produced? The answer lies in the labour-intensive process, it is simply much more expensive to produce than steel. Wrought iron production at Blist’s Hill. Chris Allen [CC BY-SA 2.0]. The earliest wrought-iron process used a puddling furnace, in which a “puddle” of congealing red-hot iron was worked manually using long rods, while later processes used multiple rolling of red-hot pig iron. Meanwhile the Bessemer steelmaking process could make vast quantities of steel in a single pass, making steel many times cheaper than wrought iron. From the late 19th century onwards its manufacture and use declined, until the last working wrought iron mill in the world closed in the 1970s. 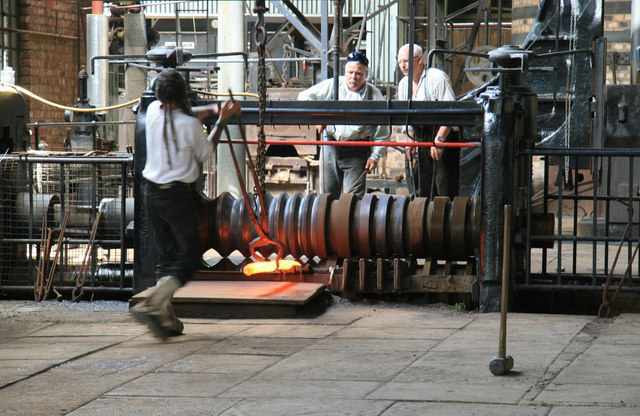 Its machinery was relocated to the Ironbridge Gorge Museum at Blist’s Hill, and it remains the only place in the world where wrought iron is produced for demonstration purposes. The piece of the restoration project I mentioned came from this source. So there you have it. Most wrought iron isn’t wrought iron at all, and your blacksmith friends will thank you for not calling it that. Should the chance to work with this rare material come your way I suggest you take it, though don’t waste it. After all, a lot of work went into making it! Header: Adam Jones, Ph.D. [CC BY-SA 3.0]. Very nice and informative. Though… now I will be inclined to correct folks who incorrectly describe a steel gate, and thus, send them to their safe space. Next could someone let us know what puts the ‘rank’ in rank stranger? So……what *DO* we call it then? Wrought steel is what it is. No wait, I got it: Bessemer mucho. Steel with a neoclassical wrought-iron appearance? “Wrought iron style” would be accurate, but I’m sure we’ll get a lot of people calling us EJWs (Engineering Justice Warriors) and that we’re dumb for using more accurate terms when everyone “already knows” what we’re actually talking about since actual wrought iron isn’t around anymore. “Decorative ironwork” is perhaps the safest. At least that doesn’t really specify what the material is, just that it’s iron (Fe) based. If you’re not a blacksmith, it is still correctly called “wrought iron” because etymology doesn’t tell you anything about the meaning of the word. Same as all the other English words; if you have a pet peeve, you already have the information that you’re incorrect, because words have multiple meanings and you’re already aware of the ones you dislike. Nah …. this is bollox ????. ‘Wrought Iron’ is a ‘thing’ just like ‘stainless steel’. If you bought a lump of stainless and it turns out to be mild then you’d naturally be rather disappointed? I always preferred 316, but some of the etching machines I worked on would rust even 316 bolts away in a day. In those machines, only titanium or plastic hardware would work. Teg, you seem upset at my comment, but you didn’t understand it. I’m saying, words have more than one meaning. When a second meaning is added, it isn’t wrong, and the existence of an older meaning never refutes the existence of the newer meaning. Why so upset at the details of how English words work? The collision of common useage and proper definitions is often unpleasant, particularly in the absence of an easy alternative (I like “wrought steel” as above). I have several blacksmith friends who are not at all uncomfortable contracting for wrought _____ so long as the customer is understood and the check clears. Interesting. I’ve long thought I would have been a blacksmith if I lived in colonial times. I’m jealous of your childhood, Jenny! A friend of mine said approximately the same thing, after he spent an afternoon making a new sword. His point was that in the modern age, it is a luxurious hobby because he loves knives and swords and gets to make them, as an art form. And if he’d lived in the past, he wouldn’t have had that sort of luxury, he’d have been working one of the hardest jobs but with average pay, and he wouldn’t have had much time, energy, and source materials for just making art and fun stuff. You could be a professional blacksmith now and have a higher standard of living than the job afforded back then. But very few people who learn the skills are interested in actually doing that as full time work. If you think you’d have been a blacksmith in the past, and you’re not really glad you don’t have to, I say don’t let your dreams pass you by, start hammering! One of the reasons I am not a professional blacksmith is that it’s not a profession that can adequately support oneself in the South of England. Great to have some of the skills and the background, not sorry not to have the hand-to-mouth existence. I suggest you have a look at BABA, the British Artist Blacksmiths Association. There are quite a lot of talented people making a good living from blacksmithing in the UK today. I’m not one of them, since I live in Herefordshire, where we are literally awash with the world’s best blacksmiths, but since you’re down south, you could probably earn decent money just making decorative custom gates! Mea culpa! Sorry, just realised that you’re the author, so of course you already know… I didn’t read the commenter names. Apologies for the likely unneeded “explanation”. “BABA”, heh! And in Britain as well! Very interesting, and a joy to read! I think they meant “like butter” at forging temperature (about 900C), because at room temperature it works just like mild steel. As a kid, I grew up on the coast of SouthEast Alaska, and had the chance to explore hundreds of miles of island coasts while growing up. Due to the extremely corrosive nature of a temperate rain forest located next to the ocean, often the only sign of previous habitation from 50 years ago or earlier were tell tale remnants of rusting steel mixed into the rocks on the beaches. Much of it was unrecognizable, but quite a bit of it that remained had a “fibrous” look to it, and it was quite malleable by hand when bending rods or thin planking spikes. It seemed to last much longer than regular steel. I even found a few large steam boilers that looked like they used wrought iron for some of the bolts. I’m sure that some of it still remains to this day, once it was covered in a few inches of mud, corrosion would effectively stop. I remember some very large, old pieces being removed from where they were covered by the shallow sea bottom mud, and they still had a clean grey iron finish once they were rinsed. Wrought iron is more resilient against rust. It has something to do with the grain structure because corrosion can’t advance very far before unvelining one of those fibrous lamelles made of slag and stop there. The corrosion advances in thin bands, and takes longer to get through to the middle. The main reason though appears to be the chemical composition of the slag, because this is beaten pig steel and not pure iron, so it often has nickel, copper, phosphorous, tin etc. which make it a kind of poor man’s stainless steel. High sulfur or chlorine content makes it worse for corrosion though. Reason being that in ironmaking, pig iron is made in a bloomery which doesn’t get hot enough to actually melt the iron. It comes out as a sintered sponge, which is then beaten to crush the mineral slag into dust and get the little nodules of iron to combine into a solid piece. That’s where the slag inclusions come from. This sounds like a very modern process for making composites, if you started with a mix of other components being sintered together. Are/were any other materials made this way? Pig iron isn’t sponge iron. The name doesn’t refer on the process used (as many blast furnaces still produce pig iron) it refers to the carbon content. Pig iron has iron content above that of cast iron and thus needs further refined to be of use. That’s correct. Sponge iron is what I meant. Highly corroded pieces would would often appear to be wrapped in an outer layer of thick rusted fibers that were in the process of separating, as the purer iron between them rusted away first. Is there anything preventing someone from starting up a wrought iron foundary? Or is it a matter of cost/scale? Make Iphone covers from it. Could you not grab a piece of conventional steel and stick it, red hot, into a set of rollers a couple of times to make wrought iron? No. You need to add the slag, and other impurities to it. Could be as well done. I guess you’d have to sprinkle red hot steel with the magic impurities dust and then fold it in a few times? That would make it more like damascus steel. 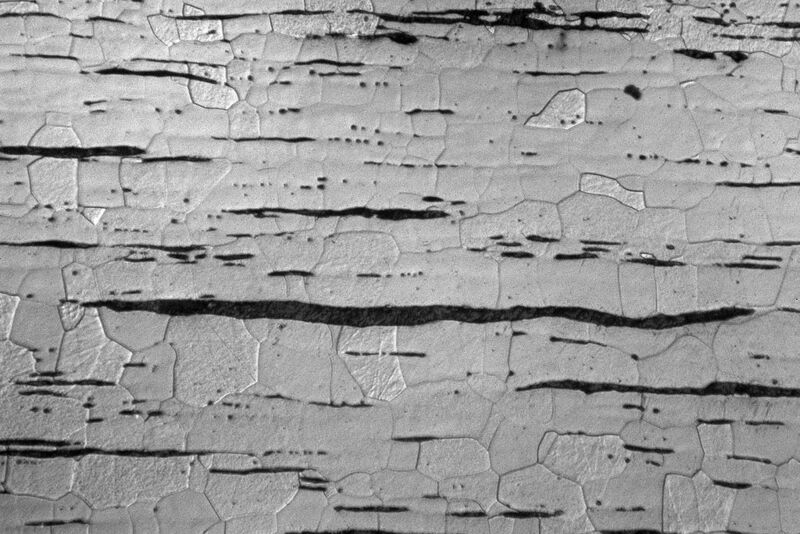 The microstructure would be different, since the inclusions come in thin bands rather than being evenly diffused. That’s called hot rolled steel and it’s incredibly common. You can still buy wrought iron made from puddling. Google it. Not of recent manufacture, you can’t. Believe me, blacksmiths have googled it. You can sometimes buy scrap, but it ain’t cheap. Jenny, never ever believe something because people with titles said they checked already. Encouraging this just makes it look like you’re being obstinate. Perhaps some blacksmiths couldn’t find it, and said so, and yet it existed? Maybe they sell everything they make and so it is hard to find out about it because they’re not motivated to get the word out? Maybe people who buy it don’t tell people where, because they don’t want the price to go up. Or even, maybe it was true when they said it, but they didn’t have a time machine to use to change what they said later when somebody started making it again. It is easier to know what you have access to than to know what doesn’t exist. Oooh. Just up the road from me. I had no idea they were there. Reworked scrap wrought iron, AFAIK. Yes, the real thing, but not of recent manufacture. And very expensive, for conservation work when some English Heritage person gets a bee in their bonnet about a bit of steel. There wouldn’t be any economy of scale, even though there are a few blacksmiths or decorative ironworkers whom would love to work with wrought iron, the shear scale of production facility required to make it requires an industrial scale of consumption as well for it to be cost-effective. So, what should you call modern “wrought iron” like a fancy gate that’s hand made out of steel? Having amassed a few bits of wrought iron over the years inevitably the time came to make some of it hot and beat it into one thing instead of two, knowing nothing about blacksmithing, other than they have big hands and everything they make is ridiculously heavy, I decided to practice on some mild steel bar, this proved so incredibly difficult that I ended up using the services of a big handed farrier, he did let me have a few whacks of my wrought iron thing to demonstrate how easy it is to work compared to steel, I’ve only ever need such things done once after this experience but if ever it comes up again I’ll be using a blacksmith, you can’t see their welds and you can see mine. Good article, thanks for writing. The skills of a Blacksmith have always intrigued me and on my bucket list is to become an entry level blacksmith. Some of the inspiration comes from visiting mines in California that still operate blacksmith shops. Most recently, for my birthday in April, we visited Gold Bug Park & Mine in Placerville, California. We spent an hour talking to one of the blacksmiths who must have time traveled from the 1800s. His explanations of metallurgical knowledge used by blacksmiths was phenomenal. I was literally in awe and very jealous of his knowledge. Even my 12 year old daughter listened intently to his explanations. He also told us about two organizations to check out, see links below. In my opinion, blacksmiths are one of the few “true craftsman” trades left in the US. All the bridges from that era on the Oregon coast are made from steel and concrete. Actually, same as all the other bridges on the Oregon coast from any era! That remain, anyways. The reason the ones is that era look different is because of the quality of the architecture. There are older steel/iron bridges across the Puyallup River in Tacoma that were recent;y replaced and there was a rush to get the metal. I heard the same wrought iron rumors then. Maybe just because they were so old and had held up so well. Sea water came in that far with the tide. Maybe I’m confusing these bridges with a historic iron bridge. I can’t find the video of the big blob of hot iron on the huge “taffy machine”. The thing is, before the railroad arrived there was almost no heavy industry in the Pacific Northwest; bridges were usually temporary. When the railroad arrived, steel was transported rather than cheaper grades of iron. There are smaller wooden bridges still standing, thanks to restoration, but when quantities of metal first became available it was mostly steel. Other regions where there were road connections to heavy industry, then you’ll find a wider range of metals and grades. Dockworks are more realistic, they brought a lot of that stuff in before the railroad came. I would definitely check local dates for rail access when considering the reasonableness of these claims. I wouldn’t just assume because people are buying it up and making things with it that it is whatever they said, because it would have extra art value from being made with recovered materials regardless of what the material is; they’re going to describe it using whatever words other people are describing it as, it should be considered non-technical. There has actually been a bunch of wrought iron coming in to the market again, they are literally dredging tons of it out of the puget sound from decayed docks and stuff like that. I have been seeing it making its way into local blacksmiths hands in the past few years. I would highly encourage that you do. I went to one of their open house tours last year and was greatly impressed. Some of the volunteers are former workers of the foundry before it “closed” in the ’90s. Got to watch the entire process of sand casted molds. This year they have events on 8/11, 9/8, 10/13, 11/10, and 12/8. Definitely worth the $10 which goes to the fund to help preserve the foundry. At one time they were hoping to turn it back in to a fully operational foundry as well as a teaching foundry. Great article, Jenny! Thank you for this fascinating look into a trade I have always admired but have had little chance to experience. Im a blacksmith, but only for about 3 years now and this finally made a lot of things clear to me. I did see true wrought iron once as a bracelet on another blacksmiths hand and he tried to explain the difference that it was a separate material than just iron. This accurately describes the piece that I saw which was polished as a bangle and it had fibrous layers to it that were very beautiful up close. I now want to acquire some of this to try working some. Most of the wrought iron in the UK was chopped up and used for steel production during WW2;whole estate railings where stripped,and never replaced…wrought iron proved a very good material for this job as when the surface corroded (old-fashioned paint wasn’t much good) the black oxide stopped the core material rusting. After the war there where far more ‘easy money’ jobs available than blacksmithing! most of the late 18th century and early 19th century blacksmiths literally worked themselves to death..producing parts for the new industries which eventually took their jobs.another irony is that most of the work modern blacksmiths get is replicating things that where ripped down as they fell out of fashion. One of the guys that taught me was also a master woodworker,but craftsmanship is too underrated;even he had trouble finding work,in either craft.He ended up going to Africa and showing the locals how to chop up wrecked tanks to turn into tools for farming and construction,once the civil war left; the countries where in rubble,and nothing was growing there to eat…an old solution to an old problem.humans forget the wrong things;craft things and don’t fight each other! or was it destroy things and kill..? My wife and I want to get iron railing installed at our house. It is interesting that what we thought was wrought iron really isn’t. I’ll have to remember that and make sure to use the correct term for the right metal.